Governments have failed to recognize cows’ role in human society and instead of serving, they send them to slaughterhouses. This is criminally shameful but it goes on in the name of development and human rights. 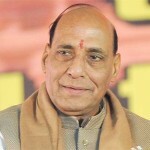 Unscrupulous political leaders are willfully distorting the issue of cow protection and presenting it as a religious issue. Cows roaming on Indian roads may have attracted some criticism but no criticism should force us to deviate from our duty. This is particularly true for those who lead societies and rule countries. A few days back someone asked a question on Quora as to why cows are allowed to roam freely on Indian roads. I thought it was a valid question for those who do not know the science behind cow protection. Most people have taken it for granted that cows are protected in India for religious purpose but hardly a few of them actually understand why cows are considered worshippable in Vedic scriptures, the main source of today’s Hindu religious practices. I gave a quick short answer that I would like to share with you. First of all, it’s not cows who are allowed by us to roam around freely, it is we, the human beings, who are allowed to encroach and roam around freely on the pasture grounds and residential areas of animals. It’s like a house owner allows someone to enter his home and then, instead of being grateful, the visitor complains why the house owner roams around freely in that place forgetting who the house belongs to. As a side point, it’s a shame of government authorities who capture or shoot wild animals when they enter cities which were once occupied by those animals. 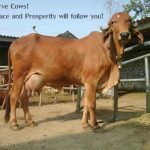 While it is better to create separate facilities for cows and give them proper care, in absence of such much-needed government sponsored facilities, and due to lack of knowledge about cows importance, people have started to consider cows as one of the other animals. Instead of keeping them at home and feeding them considering cows give them the best milk and many other products, and bulls work hard for cultivating lands, people leave them alone to find their own food. Fortunately, awareness of the environmental benefits of cows presence in our society is on the rise. What to speak of milk, even cow dung has mind-boggling health benefits. A living cow’s body is like a mobile dispensary. 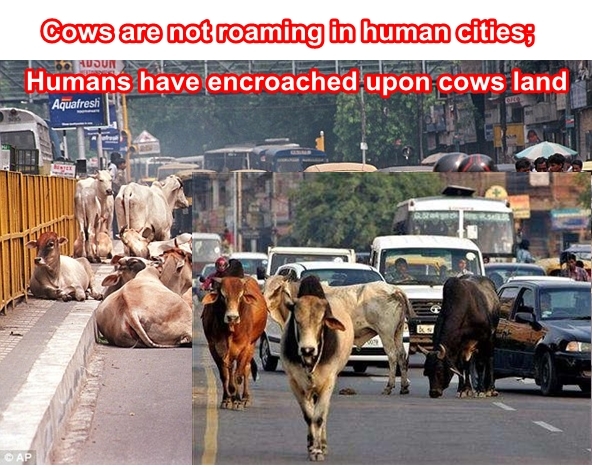 But since human beings have taken away these wonder creatures’ residents and pasture grounds, some government authorities have shown some intelligence and thankfulness in “allowing” cows to move around freely in the city. This is much, much better than capturing them and driving them away without any care. 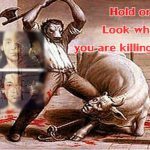 Most governments have failed in recognizing cows’ role in human society and so, instead of serving them, they have chosen to send them to slaughterhouses. This is criminally shameful but it goes on in the name of development. 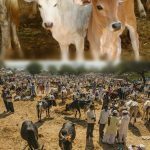 Unscrupulous political leaders are willfully distorting the issue of cow protection and presenting it as a religious issue. So even if a government may understand its responsibility towards cows, other parties create obstacles. Since in India most people still understand cows importance including the medicinal benefits of cow dung and cow urine, they don’t mind cows on the road. At the moment I am on a trip to Gujarat and am so happy to see cows roaming around freely without any fear although it would have been much better to see them properly cared for instead of seeing them searching for food and making roads look dirty. Serving cows is one of the most effective ways to prosper and live in a healthy environment. Indeed, the question is not whether to allow animals, not to speak of cows, in cities or not; it is whether humans have the right to make rules for animals. Human beings are given enough space to live peacefully on the earth but due to their increasingly greedy nature and tendency to control, they are capturing more areas, including in waters and in the space. No amount of land is going to be enough for us so far we don’t learn to live like real humans. Vasudhaiva kutumbakam points at universal brotherhood but such statements are considered good only on papers, and social and political leaders use them just to get some followers. There are baseless propaganda that the earth is getting over populated. This is not true. There is enough space on our planet but it is controlled by a handful of people. 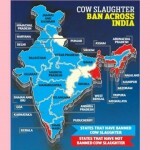 If this can be regulated there is no need to encroach upon cows and animals land.